This week I've been trialling some pieces from bareMinerals which I was sent to try. Mineral make-up tends to polarise the beauty community- people either love it or hate it. Even if you haven't gotten along with their bestselling foundation, I urge you to try the bareMinerals make-up range, particularly the eye colours which I'm sure would impress any make-up aficionado. I've attempted some swatches to give a rough indication of colour but the camera really doesn't capture the irridescence or vibrancy of the shades. Hopefully my descriptions will help but please feel free to ask any questions in the comments section and I'll do my best to answer! First up, I was sent three on-trend shades from the Eye Colour range. bareMinerals' Eye Colour range is divided into three textures; A Glimmer of Eye Colour (high intensity sheen), A Glimpse of Eye Colour (soft & sheer with a touch of glow) and A Velvet of Eye Colour (the most opaque of the three). I used my bareEscentuals Double Ended Precision Brush, £24, to apply- a bit of a wonder tool which makes professional eye make-up easy to achieve. I absolutely loved that the colours can be used dry (surprisingly little drop considering they are loose powders) or wet for a shock of intense colour. I even managed to use the shades as an eyeliner when applied wet with an appropriate brush. Inevitably, dry application gives a softer, more wearable finish and makes blending easier. I did like the idea of using them wet and would certainly consider this for a night out, particularly as the colours have good staying power. I'd say Bloom was my least favourite of the three but purely because I loved the others so much- there's nothing wrong with Bloom but purple does need to be a very specific shade to work well on eyes and I didn't find that this suited my pale complexion very well. If anything, I prefered this one wet as it is then clear you're wearing make-up and not simply tired/ been punched! I really liked the turquoise green of Azure. It needs to be carefully blended but has just the right amount of irridesence to prevent it looking too young. By far my favourite of the three is Surprise, the most beautiful shimmery pale blue which looks absolutely stunning on eyes. I'm looking forward to creating a colourful twist on my signature smoky eye with this on my next night out. 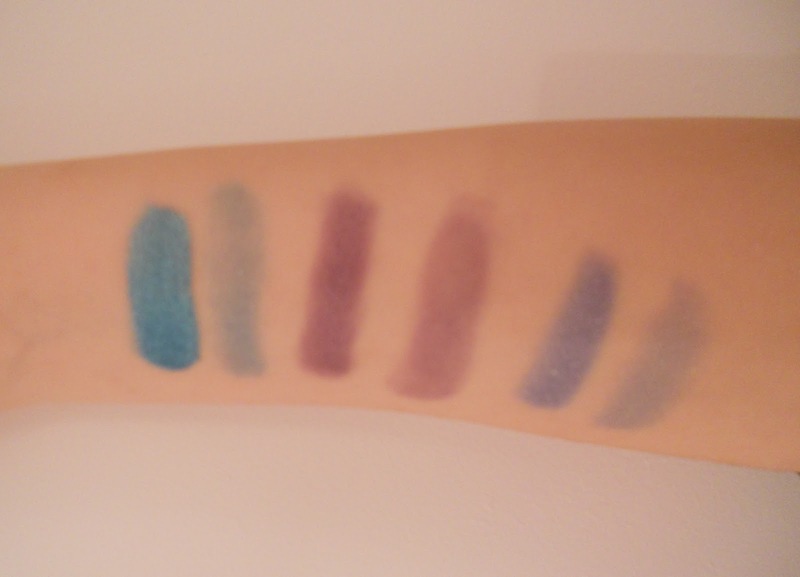 The eye colours are £14 each which I feel is a fair price given the quality and versatility. A little goes a long way so they are sure to last for some time. Left to right: Azure wet, Azure dry, Bloom wet, Bloom dry, Surprise wet, Surprise dry. I also received Buxon Plumping Lip Polish in Kanani and Lip Colour in Red Velvet Cake. 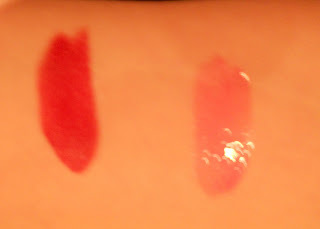 The Lip Polish is a generous, chunky tube which seems quite young in its appeal. The colour looks like Barbie pink in the tube but is just subtle enough upon application- don't be too heavy handed as it has the potential to verge on WAG territory, especially with its hi-gloss finish. It has a sweet, caramel scent upon application. As with most lip plumps, the gloss tingles on the lips. I couldn't detect any significant plumping- I'd say the shiny finish gives the lips dimension and therefore the illusion of fullness. At £18, it's not something I'd personally go for but if you're into a glossy finish, you'd no doubt like this. Again, the Lip Colour wasn't a shade I'd personally go for and I'm afraid that my photo hasn't captured the true colour successfully- despite looking like it has orange undertones, I noted brown instead. I'd describe it as a brick red which might look good on darker skin tones. The colour applied beautifully- I didn't bother with a brush, using it directly from the tube. I found it easy to control and liked the silky feeling. The lipstick wore well on my lips, lasting from morning to lunchtime. bareMinerals lipsticks are presented in weighty black tubes which are priced at a fair £14.